APO/FPO Thanks a Million Gift Box. Say "Thanks a Million". 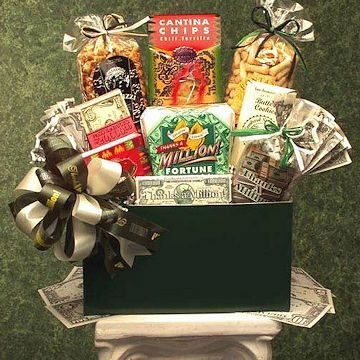 Convey your gratitude with a gift basket and make that certain someone feel like a million bucks! Let them know you appreciate their thoughtfulness with a wealth of snacks and treats in a large hunter green gift box. Nothing says thanks like the rich goodness of gourmet. Send the Thanks a Million gift basket. This gift includes: Thanks A Million Fortune Cookies, Chunky Salsa (box), Brent & Sams Chocolate Chip Cookies w/ A Thanks A Million Label, Nacho Tortilla Chips, Parmesan Focaccia Bites, Crunchy Caramel Corn 5 oz, Thanks A Million Theme bag w/ Mints, Thanks A Million Bite Size Cookies in a Theme Box, 1/2 oz Stone Wheat Crackers, Large Hunter Green Gift Box.